"I think the JAM is the highest quality iOS guitar interface on the market and highly recommend this device for any iOS or Mac user creating music. The quality is good enough that a pro can use it and the cost is cheap enough that average Joe Blow garage rocker can afford it to record his rock opera magnum opus. Professionals are finally starting to take the iOS seriously and this is reflected in the quality of products currently being released for iOS devices." "Technical minutia aside, let’s talk about where the Jam really shines: fun. The Jam is incredibly fun to use. It opens up a whole new world of musical possibility. Now, you can transform your iPad and iPhone into your guitar’s best pal. Just plug in the Jam, boot up an amp app (of which there are some great ones on iTunes), plug your guitar in, and get lost in the sounds of different amps, pedals, microphones, cabinets — all available to you from the comfort of your couch. With the Jam and all the great guitar apps out there, it’s truly amazing how much you can do." "The sound quality and fidelity, low latency and ease of use that we’ve come to expect from this company are again present in these new products. I expect more and more recordings to be produced using these types of interfaces. I, for one, am hooked." "Traveling with a guitar amp is just not always possible and very costly with today’s airline fees. I found a product that will allow me to play guitar as if I had an amp"
"Although the gizmo costs $99 (£79), the convenience and freedom it gives any guitarist ensures that you are not wasting a single penny. In fact, its portability alone and its performance really out performed what I expected from a relatively small, plastic accessory. 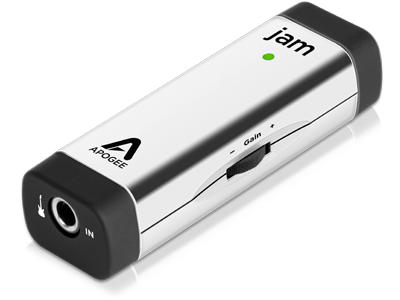 I simply don’t see a downside to buying the Jam by Apogee. It’s a lot of fun and can be taken anywhere. Awesome!" "Compared to other iPad guitar inputs I've used, like Griffin's GuitarConnect Cable and IK Mulitimedia's iRig, the Jam had the clearest sound. The Griffin is too overdriven and could benefit from a gain control knob.The iRig sounds better than the Griffin, but there's a little noise in clean tones. Neither the Griffin or iRig can plug into your Mac."